The Eradicator hovers over the city of Markovia and Doomsday looks up from the ground. The Looker wants Eradicator gone because of the treaty signed with New Krypton, they have been at war with their neighbors. As the Outsiders are discussing what to do about the situation, the Eradicator comes crashing in, visibly hurt. The Kryptonian killing machine Doomsday stands between the Outsiders and its prey, the Eradicator. Arrogantly, the Outsiders decide to take down the beast or die trying and begin to exhibit their collective powers upon him. Meanwhile, over in Eastern Europe at the Checkmate Headquarters, Amanda Waller has a mission for Owlman, Black Lightning and Metamorpho. Their mission is to stop Geo-Force from going nuclear somehow. Waller calls them 'expendable' so they all bicker over what to do. Freight Train starts to flirt with Thunder who is slightly annoyed. Coming to her defense is Grace, who plows Freight Train through a wall. The team discusses further that Geo-Force is out of control and the situation will get worse if they do not do something about it. Black Lightning departs, pondering killing his best friend in the next day. We return to Markovia... Halo tries to disorient Doomsday with her powers which are to no avail. Katana attempts to take his soul with her sword but Doomsday swats her away like an annoying bug. Looker illuminates Doomsday with her vision powers but Doomsday just slams her into the rubble. The Olympian threatens Doomsday with some awesome words but Doomsday knocks his helmut off in mid trash-talk. Doomsday punches him several times in the face and finally smashes him into the ground. Geo-Force and the Eradicator are left now as Doomsday begins to glow with power. It appears he is now absorbing energy from powers used against him! Geo-Force absorbs the land of Markovia and fires it on the beast, but Doomsday retaliates and knocks out Geo-Force. Finally the Eradicator is left and uses his heat vision on him. Doomsday tries out his new powers, which he acquired from Looker on Eradicator and then finally impales him with his bone spurs. 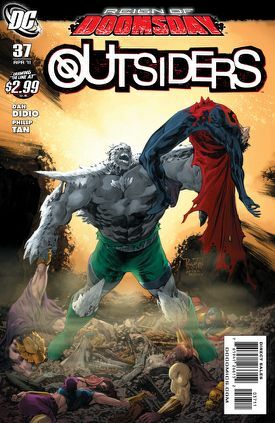 Doomsday carries away the Eradicator in victory, leaving the Outsiders totally shattered. [Reign of Doomsday continues in Justice League of America #55]. Story - 3: The story starts out with discussion and quickly moves into action. As the Outsiders assemble to fight the beast, they are convinced they will take him out or end up dead. How thoughtful. The monster that took out the Justice League and Superman many years ago will succumb to these guys... right now... I highly doubt it. Over at the Checkmate headquarters, Amanda Waller brings in Owlman, Black Lightning and Metamorpho among others for a special mission: Stop Geo-Force! I loved Owlman's line about taking his chances at Gitmo (Guantanamo Bay, Cuba for those who didn't know) rather than do anything for Waller. The dialogue here between them all is pretty hilarious. After some ruckus between Freight Train and Grace, we see Waller back in her office, where she smirks victory "works every time." This will be interesting to see where this story is going for you readers of Outsiders. Throughout the issue the team is both arrogant and confident in taking down Doomsday each alone, and they all fail in doing so. I found this to be "entertainingly numb" for two reasons. The whole storyline is called Reign of Doomsday. Doomsday is going after certain individuals (first Steel, now Eradicator) and now can absorb powers and use them much like Parasite. The second reason is because of all the nonsense dialogue from the Outsiders. It was funny to read them talk smack while they attempted to defeat the monster. It was just numb because after each attempt, you knew they were going to fail! None of them even hurt him the slightest bit. I did some research and found the Eradicator and the Outsiders have much history together. Now, I haven't read comics in years, so I need some fan help here. I will be reading the "Who's Who" to figure it all out! 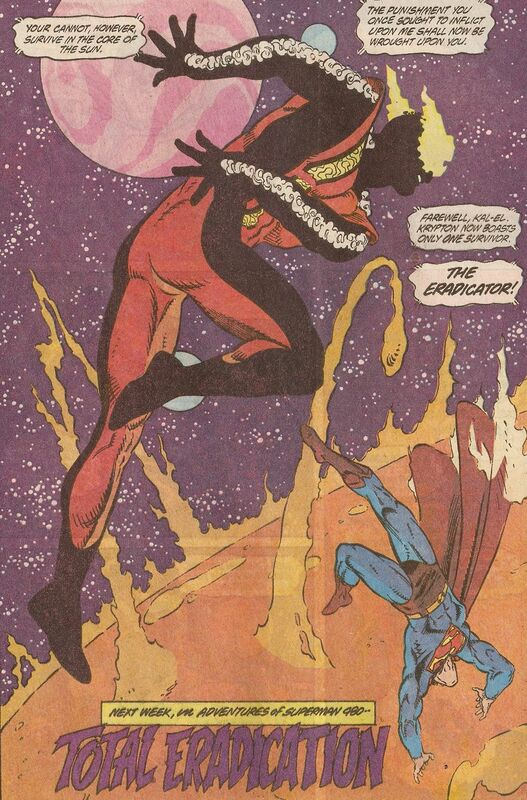 I do prefer the 1990s Man of Steel Eradicator when he threw Superman into the Sun. So basically this entire issue was a slug-fest and for the most part, I enjoyed it. Was it worth $2.99? Meh. Maybe back in 1993. Art - 4: Philip Tan does a really swell job with depicting Markovia as a dark place. He also is loyal to keeping the appearance of Doomsday the same which is great for continuity! There is so much action going on this issue that you must pay attention to both the script and the artwork in order to get the full effect. Doomsday is an unstoppable killing machine bent on death and destruction and Tan depicts him in the same manner. I especially like how Doomsday is drawn with powers not affecting him, the glow of energy surrounding his massive body. This issue is full of Booms, Blams, Ka-Thooms, Kerblams, Flazzhhhs, Fooshes, Thumps, Krak-ows, Whamps, Flasshes, and finally my favorite noise, the Sllitt! Tan draws out the pain in the Eradicator's face to perfection with shock and awe that he was defeated with such ease. YEAAAARGH!!! Cover Art - 3: While not a completely dull cover, it is a little boring to look at. It has Doomsday holding onto Olympian by the foot and the Eradicator is hoisted up (the wrong way - he stabs him in the stomach, not back) on his bony fist, while the Outsiders are laid out in defeat. It pretty much spoils that Doomsday kicks all their butts (no surprise there). I prefer cover art that grabs your attention, tempting you to look inside and see how it all went down. This did the trick, but it could have been drawn a lot better for impact purposes. 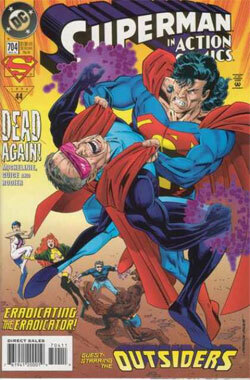 Check out the Comic Index Lists for the complete list of Superman-related comics published in 2011.